The most popular sights of St. Petersburg are magnificent squares and temples, monuments and museums.Very close to the front facades are the courtyards of St. Petersburg, which can be courageouslycalled the museums that are open to the sky.Exactly these densely built houses and their gloomy courtyard territories that allow to open another face of the city, to understand the spirit and history of St. Petersburg. How did the courtyards appear? To build houses "a solid facade" was ordered by Peter.The land in the Northern capital was constantly appreciated and the building of P-shaped houses became wasteful.The lack of land in the center of the city leads to the building of constructions which closely adjacent to each other.In such way the whole section with a solid façade has appeared.At the same time, profitable houses are becoming popular.To get the maximum profit, homeowners built up their plots as tightly as possible.Then they began to build up to 5-6 floors of street facades and later - outbuildings that went into the courtyard, and then it was blocked by narrow pencil houses.Thus the buildings which connected with each other of the most unusual form were formed and courtyards appeared with bizarre arches and gates.Often the rooms on the first floors did not have windows at all and were appointed for household needs. Apparently, in one of those rooms, where almost no light penetrated, F.M.Dostoevsky composed his famous works, who transfered a gloomy mood, yearning and despair to the heroes of his novels.Petersburg’s period of life of Gogol, which influenced on all his oeuvre is also connected with staying in such a dark room. After the revolution and after the war, people were glad to any room and happily settled in such accommodation.Petersburgers considered that interesting houses in the architectural plan were still better than the faceless buildings built on this place.Such buildings usually had two entrances - one front door, from the street, and the other - through the gate to the yard territory.During the Soviet era, the gates were removed, but now they have been installed in many places. Walking in the center of St. Petersburg, you can see a variety of courtyards - there are green and clean, paved with tiles, similar to European, there are real architectural monuments, and some of them - dilapidated and almost unchanged over the century.Somewhere parking places for cars are organized, and somewhere there are garbage cans or even worse - a garbage dump has formed.Often the main entrance and gates are closed on code locks and it is not so easy to get there, but usually the residents of the houses make advances to them and let the tourists visit this unusual sight of St. Petersburg. Some townspeople think that such houses were built specifically to protect against the squally wind that constantly blew from the river or the bay.It is difficult to hide from him in squares and streets, and inside the courtyard there is a ringing silence.Petersburgers say that the air here stagnates to such an extent that it can be touched, and the sky is special.Raise your eyes and you will receive as a gift his little piece of intricate shape. There are several hanging courtyards in the city, there is not ground here, but empty space, where wood and coal were stored before.Old metal beams and constructions are dilapidated and a danger exists for homes and residents from this reason. Courtyard on the 9th-Soviet, house № 10/12 was formed as a result of the junction of the two houses and is unusual in that it has a roof. Earlier the roof was glassy and flower beds with flowers and plants were located below, then the glass was broken and the roof was made of metal. Flats on one area of this house belong to different addresses of houses, one half to 10, the other half to 12, and you can get here only by entering the front yard of the house № 12. The surrounding landscape has an influence on the emotional state of a person.And from this point of view, courtyardswith their enclosed space create an unfavorable situation for a person; moreover they usually do not have greenery. On Vasilievsky Island, on the 4th line, house № 5 (the entrance from Big Avenue to the first arch, the furthest left entrance) is a small Court of spirits.Walking into it, you need to make a wish and look at a piece of the sky, and then the desire will come true. Experts recommend greening of the courtyard of such houses, although with a lack of light it is extremely difficult to execute it. The herbaceous plants and shrubs will suit for greening as they are unpretentious to light, moist air and cool summer. - Nevsky Avenue, house № 3 - Angel courtyard, entrance through a low wide arch. This courtyard is one of the most original, it has five corners. If you look up, you will see a figure in the form of wings. 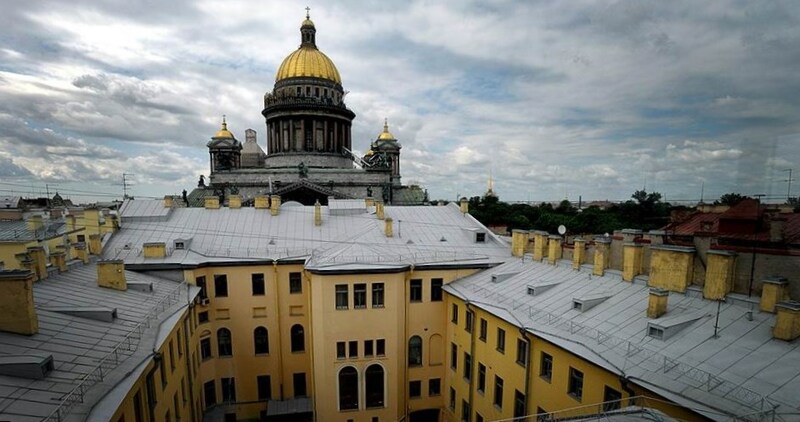 - The Courts of chapels, the enfilade of which is located between Bolshaya Konyushennaya Street and Palace Square.Now here it is clean and beautiful, there are several hotels, a restaurant and a cafe (always is opened). In the center of St. Petersburg, along the streets of Rubinstein and Gorokhovaya, on the Fontanka and Sadovaya streets there are rows of courtyards, where one can go through the chain a whole block without leaving the street. The time passes and graffiti, car parking and garbage cans appeared in the courtyards, but everyone is also looking at each other's windows of houses.The courtyards in St. Petersburg retain the incomparable architecture of the city and are remained mute witnesses of the last era.